From May 12th to 20th the 63rd edition of the Festival "Girona, Temps de Flors" will be held. 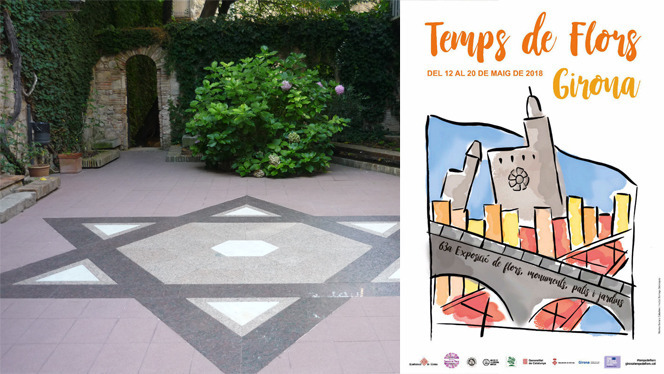 Moreover, Saturdays 12th and 19th May we will celebrate "Girona, Temps de Flors" at night, opening the museum until midnight. Time to live: This artistic work is conceived as a symbolic representation of time across our lives and how this influences us. It intends to represent past, present and future by mixing living and dried flowers, everyday objects and allegorical representations as time going by. Courtyard of the Bonastruc ça Porta Center. Exodus shows different reasons that may force people to emigrate in order to continue living according to their ideals and/or beliefs. Inner courtyard of the Museum of Jewish History. Performances by IAS Institut d'Assistència Sanitària. It's not about painting life, it's about making the painting alive: It's important to have a positive attitude in life and get the most out of all the experiences. This performance shows how it is possible to personify and give life to art, as in its title, phrase of the famous French painter Paul Cézanne. In charge of Montse Venegas Nieto, Alba Carbonero Barrantes and Maria Palahí Oliveras. Performance in the archeological site placed on the museum first floor.